BEIJING – DECEMBER 22: The halberd gate and bridge building landscape of the Imperial Ancestral Temple, on december 22, 2013, beijing, china. The article Explainer: China’s tech ecosystems and the barriers between them was written by Emma Lee for TechNode. Deng Shuang, a 34-year-old mother of one, wants to share baby shoes she found on Taobao to a mom friend via WeChat. Instead of sharing it directly from Taobao to Wechat, Deng has to go through a very clumsy process: she has to copy an auto-generated Taobao link for the item and then paste it in WeChat before she can send it. A small sharing barrier between two of China’s giant apps is no small deal, especially when millions of users go through this every day. But this is more than a technical loophole that can be fixed easily with updates: This is just one part of the walls China’s internet giants construct to guard their self-sustained gardens. Most people believe the Chinese internet is one world unto itself, but few realize there are multiple separate, loosely connected ecosystems in China’s cyberspace. Competition in China’s internet world is not about individual tech companies anymore, it’s increasingly a contest among ecosystems. “US and European internet companies usually focus on one sector and try to be the best at it. Chinese companies, however, start by focusing and solving one problem, but over time they start to attack all the problems,” William Bao Bean, managing director of Chinaccelerator, told TechNode in a previous interview. Chinese tech firms, especially early tech incumbents like BAT (Baidu, Alibaba, and Tencent), started from a vertical but with a vision to grow very big. This approach gradually developed into the “super app + ecosystem” model, where Chinese tech firms try to create expanded online platforms by leveraging the dominant status of their super apps. Super apps, usually where the giants first started, serve as anchors to drive user engagement. Tencent, the parent of China’s former default messaging app QQ, continues its dominance in social networking with WeChat. Alibaba has its old turf in e-commerce with Taobao and Baidu in its search engine app. The ecosystem surrounding a tech firm takes shape as its businesses grow; whenever a new trendy area develops, the ecosystem takes hold. Of course, the expansions still begin from the related business. Alibaba, for example, established Alipay to solve the payment problem of Taobao marketplace and Cainiao to tackle logistics issues. Since each of the tech giants got their own areas in the early days, they were more or less out of each other’s way. Yet, as they’ve grown, their business inevitably started overlapping in a grab for new emerging markets until finally what we see is comprehensive competition on each others’ home turf. When ride-hailing first boomed in 2013, Alibaba and Tencent invested in Kuaidi and Didi, two fastest growing companies in the area, respectively to set their food into the emerging market. Baidu entered the battlefield by investing in Uber. The head-on competition gradually shifted from markets like ride-hailing—which at the time was more about getting users onboard their payment platforms—to their cornerstone businesses in social networking, payment, gaming,and mobile e-commerce. While the tech powerhouses are turning competition in China’s tech world to their proxy wars, they also build an ecosystem to lock-in users. Behind the Great Firewall, China has its own equivalents of services that are blocked in the country. Similarly, Chinese tech firms have gathered complete sets of proprietary apps and services under their wings to cover every aspect of users’ daily lives so that they can have their demands met without leaving the ecosystem: e-commerce, content, payment, social networking, gaming, education. The expansion of ecosystems is either achieved by investment, acquisition, or inside the company. Chinese tech tycoons have earned a bad reputation in the early days for copying ideas from startups and crushing them with their vast amounts of resources, experience, and users. Tencent bears the brunt of this criticism and casts the shadow among China’s entrepreneurs who face the “what if Tencent copies me” dilemma. Given the fast growth of China’s internet space where trends come and go almost overnight, it is an increasingly daunting task for a single company to catch up with every emerging “whirlwind”, even for the BAT trio. On top of that, diving deep with a homegrown project may leave the company vulnerable to the instabilities of market trends. Thus acquiring or investing in upcoming verticals or startups with a ready team and product has become a more favorable choice with the extra benefit of shaking off the copycat image. 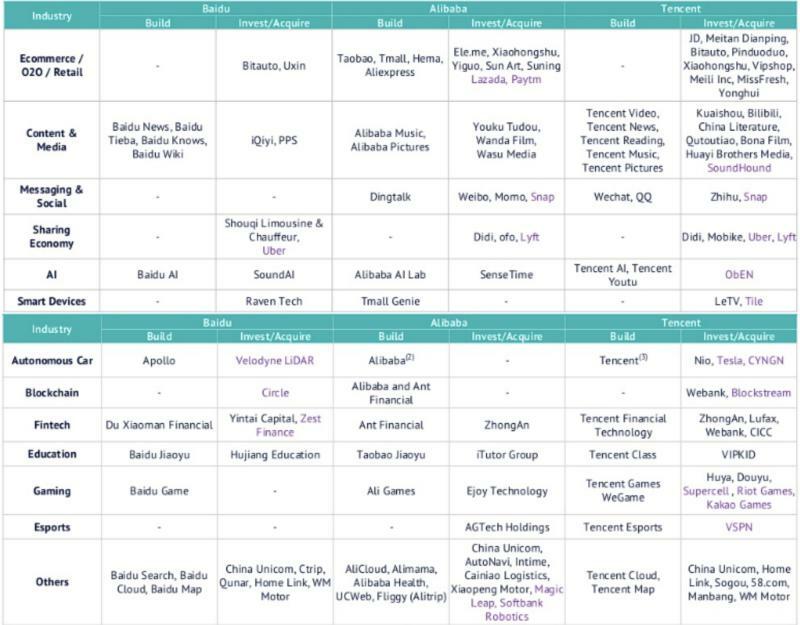 Alibaba and Tencent are two of the most assiduous dealmakers in recent years, even more active than most of the angel investors, venture capitalists, and private equity. 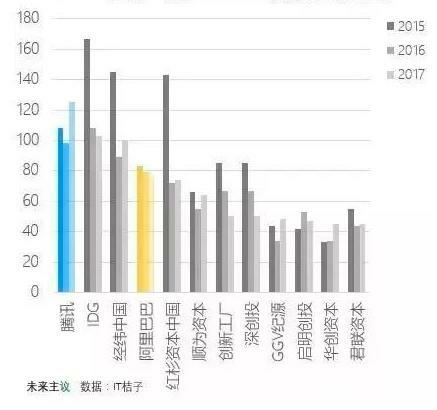 Data from ITJuzi shows that Tencent topped the venture capital list with 125 deals in 2017, while Alibaba took the fourth spot with 77 deals. Compared with Alibaba and Tencent, Baidu is conservative. Image credit: MBAChina; Data from ITJuzi. Tencent in blue, Alibaba in yellow. The effect of these large-scale land-grabs effectively split China’s tech world into different camps. Over half of China’s unicorns are either founded or invested by BAT, and north of 90% of the companies with a market cap of $5 billion or more are related to the trio, according to data from Ctoutiao. But companies may have their own investment styles. Alibaba tends to take large or controlling shares and get deeply involved in the operations of these companies. Tencent takes a hands-off approach, only investing a minor stake. This explains why Tencent has more deals. But the approach also puts the social and gaming titan land in trouble. A WeChat post went viral earlier this year, criticizing Tencent for “losing its dream” and spending its time seeking investment-worthy apps instead of working on its own products. The power of a super app and the importance of being a member of the ecosystem is best exemplified in the case of the incredible rise of Pinduoduo, which achieved RMB 100 billion gross merchandise volume milestone less than 3 years after its inception, a benchmark that took Taobao five years and JD ten years to achieve. Pinduoduo’s viral growth is deeply ingrained in the WeChat ecosystem, which offers a whole set of resources for user engagement, cloud service, as well as payment solutions for buyers to complete the purchase circle. “If services provided by Tencent to us become limited, compromised, restricted, curtailed or less effective or become more expensive or unavailable to us for any reason, including the availability of our mini-program within Weixin (the Chinese version of WeChat), our business may be materially and adversely affected. Failure to maintain our relationship with Tencent could materially and adversely affect our business and results of operations,” the company admitted in its prospectus. The loss of a giant backer could be detrimental. Shares of Chinese micro-lender Qudianplunged to their lowest price since its listing over concerns that Ant Financial will not renew its strategic partnership with the cash lender when their deal ends by August. As competition tightens, China’s tech behemoths are raising the ecosystem wall by blocking services from outsiders or offering more benefits to guarantee user fidelity. In May, WeChat rolled out tightened restrictions on sharing external audiovisual links in its Moment feed, which practically banned links from all the popular streaming sites like Douyin, Kuaishou, Ximalaya, with the exception of those backed or developed by Tencent. Although the ban was removed three days later, the underlying principle for granting access to its most valuable traffic source is pretty clear—Tencent allies only. Alibaba announced its all-in-one 88VIP paid membership plan in August. Alibaba users with a Taoqi Value—a scoring system calculating purchasing history and individual credit— higher than 1,000 can purchase an RMB 88 annual membership for Tmall Supermarket, Tmall Global, Youku, Ele.me, Xiami Music, and Taopiaopiao. Users with a Taoqi Value lower than 1,000 have to pay RMB 888 for the membership. The over 1,000% difference between the 2 membership fees implies that the key is to have those top buyers and frequent lifestyle services users locked in. “Alibaba’s mission makes it impossible for us to become an empire-like business. We believe that only by creating an open, collaborative and prosperous ecosystem that enables its constituents to fully participate can we truly help our small business and consumer customers. As stewards of this ecosystem, we spend our focus, effort, time and energy on initiatives that will benefit the greater good of the ecosystem and its various participants,” said Alibaba chairman Jack Ma in an open letter before the company’s 2014 IPO. Ma’s philosophy speaks of how all of the tech giants navigate their businesses. Tencent and Alibaba’s ecosystems are still the most developed, with Baidu’s following closely behind. Upcoming tech firms like Xiaomi, Didi Chuxing, ByteDance, Meituan are forging their own ecosystems in respective fields of smart hardware, mobility, content, and O2O. But still, they are playing catch-up. Didi and Meituan, although already unicorns by themselves, are related to Alibaba and Tencent through investments. The article Explainer: China’s tech ecosystems and the barriers between them first appeared on TechNode. The post Explainer: China’s tech ecosystems and the barriers between them appeared first on e27.